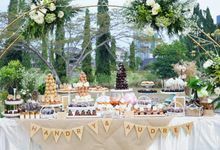 La Casa kasih ide yg berbeda untuk wedding cake. 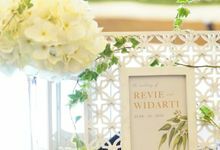 Waktu wedding temen2 pada comment unik, keren, berbeda. Rasa oke dan terutama tanpa pengawet. Memamg ngga tahan lama sih tp sehat kue nya. Hehe. TOP service nya! Menyesuaikan dengan request. Puas pokoknya!! 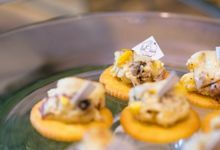 Sukses terus buat La Casa Pastry. Kalo mau cari yg beda, unik, enak cari La Casa Pastry.. 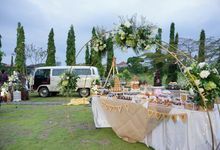 It's a pleasure for us to serve on your happiest day. Thank you Felicia for believing us and giving your sincere reviews. Wish you a blissful marriage dear. 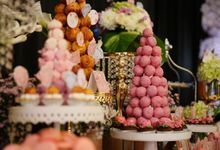 The Best Sweet Corner in Town! It's a pleasure for us to serve on your happiest day. Thank you Audrey for believing us and giving your sincere reviews. Wish you a blissful marriage dear. 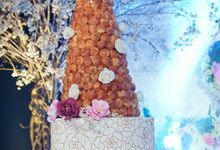 Kami memilih croquembouche sebagai wedding cake. 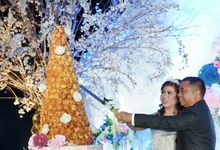 Kami sengaja memilih wedding cake yg agak berbeda dari biasanya dan yang penting "real cake" dan hasilnya sesuai dengan harapan kami. Rasanya enak dan beberapa tamu yang makan juga bilang enak. Tampilanya juga menarik. Apalagi yang rasa rum :) Service juga memuaskan. 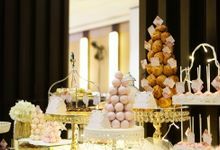 Semakin sukses buat La Casa Pastry. It's a pleasure for us to serve on your happiest day. Thank you Selvy for believing us and giving your sincere reviews. Wish you a blissful marriage dear. 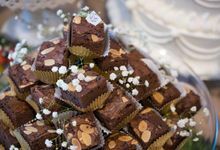 Our highly experienced bakers take a great ingredients to create mouth-watering meals, guaranteeing both freshness and flavour. 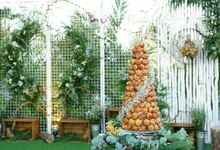 You can also ask for a custom theme croquembouche, giving you that additional satisfaction on one of your most meaningful days. Our business started way back in 2015. 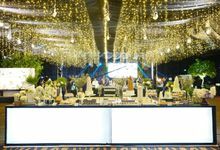 We're currently one of the most prominent vendors in our field. 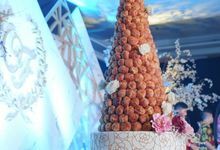 We make a pastry, especially choux pastry for your special occasion. 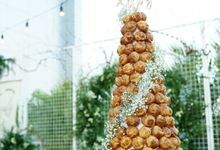 For our most prestigious menu, it would be The Croquembouche. 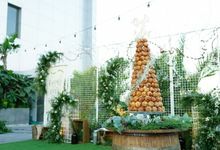 Many of our clients love our croquembouche since it could be decorate just as your preference. We also have some dessert which is choux/cream puff. You can check out our menu for more details about the flavor. Bon appetit! 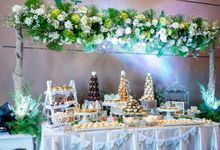 The most ideal time would be at least 3 weeks before, so we could get all the detail and make it perfect for your big day! Yes, it's true that we're concern for making the beauty of appearance, but not only that! We knew well that we make a product to be enjoyed and satisfying your palate, therefore without a superior quality of taste it's all just meaningless. Yes We manage it all, so you need nothing to worry about. 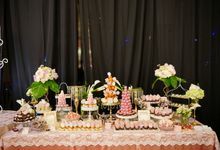 Yes We don’t let the party started without the sweet corner well prepared. Therefore, we will take care of it. Our business started way back in 2015, but we've baking since 2002. 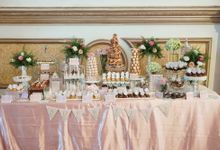 We're currently one of the most prominent vendors in the sweet corner & wedding cake business. 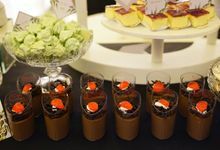 Premium ingredients and secret recipe, make us serve only for the one who seeks for high-quality dessert. 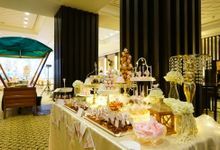 Our highly experienced pastry chef selectively premium ingredients, assuring both freshness and scrumptious flavor. Preferably 3 months in advance, considering the tasting, selecting, and deciding process of your most wanted dessert menu. 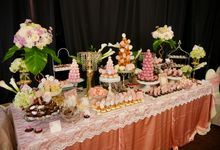 Our minimum number of serving is 200 persons, assuming a Private Party. 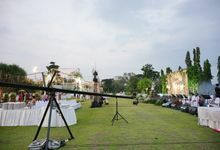 And the maximum number of 1500 persons for a larger party. 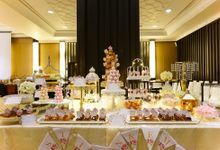 We are choux pastry specialist, designed to cater to the most discerning of taste buds. 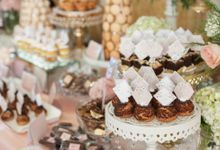 Present with a highly selected ingredient to make your dream dessert table. 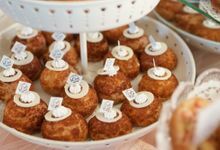 Let’s have a sweet and tasty meeting with us to get your best choux for your big day!